As a startup, you’re often strapped for cash; so one of the first things you should do when deciding which products and services to use is perform a cost analysis of substitutes. You absolutely need a business fax number, which means you’ll want to compare the costs of an online fax service versus a traditional fax machine. For our own business, we use an online fax service because it makes sense in terms of cost savings and convenience. Without knowing anything about your business I would recommend getting an online fax service, but you should do what makes sense for your particular business needs. The initial costs of a traditional fax machine are much more than that of an online fax service. With a traditional fax machine, you pay for the equipment (i.e. fax machine) up front. With an online fax service, you don’t need to purchase any equipment or install new hardware other than your computer, meaning you’ll spend a lot less from the start. An on-site maintenance check for a traditional fax machine costs around $50 with extra for parts and labor. Online Fax requires no such costly maintenance. The Environmen tal Protection Agency and the Energy Department considers fax machines to be one of the most “energy intensive” types of business equipment as they are permanently switched on waiting for arriving faxes. On average, this equates 321 kilowatt hours of electricity used per machine, per year. 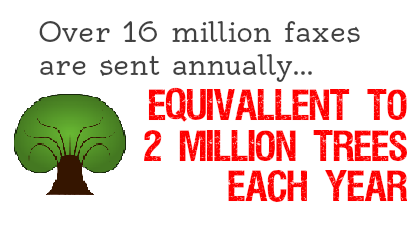 Traditional Fax uses on average, 5,000 sheets of paper annually. Nationally, this amounts to 200 billion pages used per year. Harmful chemicals such as chlorine, sodium hydroxide and hydrogen peroxide are used as whitening agents to make fax paper. 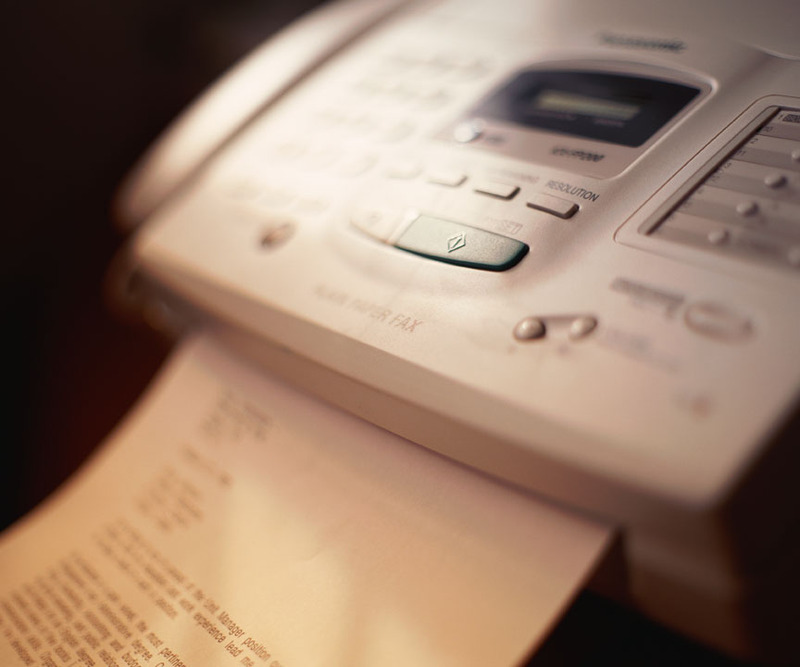 Fax machines also emit gases that harm the environment such as carbon dioxide, ozone and styrene. Online fax services are capable of sending multiple faxes at once. Faxes can be sent from any smartphone, tablet, laptop or desktop. This allows for faxing on the go. No more wasteful printing of junk faxes. Online faxes are sent directly to the recipient’s email inbox. When a fax is printed by a fax machine, it sits in the tray. This means it can be easily lost, misplaced or read by someone other than the recipient. Online faxes are sent and received using encrypted transmissions. Phone lines are not encrypted and can be exploited by hackers. As you can see above, the costs of an online fax service are much lower than those of a traditional fax machine. The main advantages of a traditional fax machine are that, unlike an online fax service, a fax machine doesn’t require an Internet connection to send and receive faxes, and your fax number won’t change if you decide to switch service providers. However, you can use an online fax service and make sure your fax number won’t change by transferring (i.e. “porting”) your number into the online fax service you want to use. Read our STARTicle that gives you detailed instructions on how to port your existing fax number to an online fax service. I’m a firm believer that an online fax service is the best option for most businesses. We use online fax ourselves and will continue to use it. Here is an overview of online faxing, with more details and benefits on this new business technology. For information on how to set up your fax number with an online fax service, read our guide, How To: Set Up a Fax Number. I use to have my own business. And I did have the traditional fax machine. It was a huge expense mostly in the ink. I was not at that time aware of other options, I wish I knew then what I did not know because it cost a lot of money mostly due to spam faxes from businesses trying to get me to buy some trip to Cancun or something. On line printing and online fax services are way better than doing it yourself. Especially for a small new business owner as I ways. Thanks for the helpful information in your blog, enjoyed. Thanks for your comments Lee. There are typically one-time charges to transfer your old fax number into the online fax provider’s system. The main disadvantage to an on-line service versus a land-line are the toll charges. If you have to forward your old fax number to the fax number of the service then you’ll probably pay a toll for every minute used by the fax, and then you have to pay tolls for outbound usage, too. So if your volume of faxing is high-enough, then the online service becomes more expensive.